Devon (/ˈdɛvən/), also known as Devonshire, which was formerly its common and official name, is a county of England, reaching from the Bristol Channel in the north to the English Channel in the south. It is part of South West England, bounded by Cornwall to the west, Somerset to the north east, and Dorset to the east. The city of Exeter is the county town. The county includes the districts of East Devon, Mid Devon, North Devon, South Hams, Teignbridge, Torridge, and West Devon. Plymouth and Torbay are each geographically part of Devon, but are administered as unitary authorities. Combined as a ceremonial county, Devon's area is 6,707 km2 (2,590 square miles) and its population is about 1.1 million. Devon derives its name from Dumnonia. During the British Iron Age, Roman Britain, and the early Middle Ages, this was the homeland of the Dumnonii Brittonic Celts. (The shift from "M" to "V" is a typical Celtic consonant shift.) The Anglo-Saxon settlement of Britain resulted in the partial assimilation of Dumnonia into the Kingdom of Wessex during the eighth and ninth centuries. The western boundary with Cornwall was set at the River Tamar by King Æthelstan in 936. Devon was later constituted as a shire of the Kingdom of England. The north and south coasts of Devon each have both cliffs and sandy shores, and the county's bays contain seaside resorts, fishing towns, and ports. The inland terrain is rural and generally hilly, and has a lower population density than many other parts of England. Dartmoor is the largest open space in southern England, at 954 km2 (368 square miles); its moorland extends across a large expanse of granite bedrock. To the north of Dartmoor are the Culm Measures and Exmoor. In the valleys and lowlands of south and east Devon the soil is more fertile, drained by rivers including the Exe, the Culm, the Teign, the Dart, and the Otter. As well as agriculture, much of the economy of Devon is based on tourism. 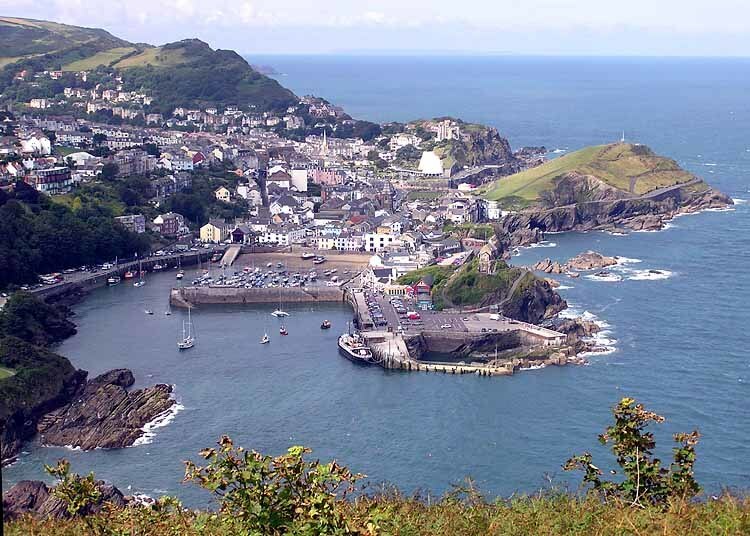 The comparatively mild climate, coastline and landscape make Devon a destination for recreation and leisure in England, with visitors particularly attracted to the Dartmoor and Exmoor national parks; its coasts, including the resort towns along the south coast known collectively as the English Riviera; the Jurassic Coast, and North Devon's UNESCO Biosphere Reserve; and the countryside including the Cornwall and West Devon Mining Landscape. The name Devon derives from the name of the Britons who inhabited the southwestern peninsula of Britain at the time of the Roman conquest of Britain known as the Dumnonii, thought to mean "deep valley dwellers" from proto Celtic *dubnos 'deep'. In the Brittonic, Devon is known as Welsh: Dyfnaint, Breton: Devnent and Cornish: Dewnens, each meaning "deep valleys." (For an account of Celtic Dumnonia, see the separate article.) Among the most common Devon placenames is -combe which derives from Brittonic cwm meaning 'valley' usually prefixed by the name of the possessor. The term "Devon" is normally used for everyday purposes e.g. "Devon County Council" but "Devonshire" continues to be used in the names of the "Devonshire and Dorset Regiment" (until 2007) and "The Devonshire Association". One erroneous theory is that the "shire" suffix is due to a mistake in the making of the original letters patent for the Duke of Devonshire, resident in Derbyshire. However, there are references to "Defenascire" in Anglo-Saxon texts from before 1000 AD (this would mean "Shire of the Devonians"), which translates to modern English as "Devonshire". The term Devonshire may have originated around the 8th century, when it changed from Dumnonia (Latin) to Defenascir. Kents Cavern in Torquay had produced human remains from 30–40,000 years ago. Dartmoor is thought to have been occupied by Mesolithic hunter-gatherer peoples from about 6000 BC. The Romans held the area under military occupation for around 350 years. Later, the area began to experience Saxon incursions from the east around 600 AD, firstly as small bands of settlers along the coasts of Lyme Bay and southern estuaries and later as more organised bands pushing in from the east. Devon became a frontier between Brittonic and Anglo-Saxon Wessex, and it was largely absorbed into Wessex by the mid 9th century. A genetic study carried out by the University of Oxford & University College London discovered separate genetic groups in Cornwall and Devon, not only were there differences on either side of the Tamar, with a division almost exactly along the modern county boundary dating back to the 6th Century but also between Devon and the rest of Southern England, and similarities with the modern northern France, including Brittany. This suggests the Anglo-Saxon migration into Devon was limited rather than a mass movement of people. The border with Cornwall was set by King Æthelstan on the east bank of the River Tamar in 936 AD. Danish raids also occurred sporadically along many coastal parts of Devon between around 800AD and just before the time of the Norman conquest, including the silver mint at Hlidaforda Lydford in 997 and Taintona (a settlement on the Teign estuary) in 1001. Devon has also featured in most of the civil conflicts in England since the Norman conquest, including the Wars of the Roses, Perkin Warbeck's rising in 1497, the Prayer Book Rebellion of 1549, and the English Civil War. The arrival of William of Orange to launch the Glorious Revolution of 1688 took place at Brixham. Devon has produced tin, copper and other metals from ancient times. Devon's tin miners enjoyed a substantial degree of independence through Devon's Stannary Parliament, which dates back to the 12th century. The last recorded sitting was in 1748. Like neighbouring Cornwall to the west, historically Devon has been disadvantaged economically compared to other parts of Southern England, owing to the decline of a number of core industries, notably fishing, mining and farming. Agriculture has been an important industry in Devon since the 19th century. The 2001 UK foot and mouth crisis harmed the farming community severely. Since then some parts of the agricultural industry have begun to diversify and recover, with a strong local food sector and many artisan producers. Nonetheless in 2015 the dairy industry was still suffering from the low prices offered for wholesale milk by major dairies and especially large supermarket chains. Part of the seafront of Torquay, south Devon, at high tide. The attractive lifestyle of the area is drawing in new industries which are not heavily dependent upon geographical location; Dartmoor, for instance, has recently seen a significant rise in the percentage of its inhabitants involved in the financial services sector. The Met Office, the UK's national and international weather service, moved to Exeter in 2003. Plymouth hosts the head office and first ever store of The Range, the only major national retail chain headquartered in Devon. Since the rise of seaside resorts with the arrival of the railways in the 19th century, Devon's economy has been heavily reliant on tourism. The county's economy followed the declining trend of British seaside resorts since the mid-20th century, but with some recent revival and regeneration of its resorts, particularly focused around camping; sports such as surfing, cycling, sailing and heritage. This revival has been aided by the designation of much of Devon's countryside and coastline as the Dartmoor and Exmoor national parks, and the Jurassic Coast and Cornwall and West Devon Mining Landscape World Heritage Sites. In 2004 the county's tourist revenue was £1.2 billion. More successful visitor attractions are particularly concentrated on food and drink, the South West Coast Path and watersports, including sea-view restaurants in North-West Devon (such as one example belonging to Damien Hurst); surfing there, indoor and outdoor folk music festivals across the county and sailing in the 5-mile (8.0 km) hill-surrounded inlet (ria) at Salcombe. Incomes vary significantly and the average is bolstered by a high proportion of affluent retired people from across Europe's major cities, particularly from the rest of England. Incomes in much of the South Hams and in villages surrounding Exeter and Plymouth are above the national average. The claimant count of the unemployed and people receiving very low incomes is close to the national average of 4.5% in Torbay, Plymouth and Exeter. Their exurbs and rural villages contribute to low unemployment in the administrative county as shown below. The table also shows the population change in the ten years to the 2011 census by subdivision. It also shows the proportion of residents in each district reliant upon lowest income and/or joblessness benefits, the national average proportion of which was 4.5% as at August 2012, the year for which latest datasets have been published. It can be seen that the most populous district of Devon is East Devon but only if excluding Torbay which has marginally more residents and Plymouth which has approximately double the number of residents of either of these. West Devon has the fewest residents, having 63,839 at the time of the census. The key train operator for Devon is Great Western Railway, which operates numerous regional, local and suburban services, as well as intercity services north to London Paddington and south to Plymouth and Penzance. Other intercity services are operated by CrossCountry north to Manchester Piccadilly, Edinburgh Waverley, Glasgow Central, Dundee, Aberdeen and south to Plymouth and Penzance, and South Western Railway,operating services between London Waterloo and Exeter St Davids via the West of England Main Line. All Devon services are diesel-hauled, since there are no electrified lines in the county. The Exeter to Plymouth railway of the LSWR needs to be reopened to connect Cornwall and Plymouth to the rest of the UK railway system on an all weather basis. There are proposals to reopen the line from Tavistock to Bere Alston for a through service to Plymouth. On the night of 4 February 2014, amid high winds and extremely rough seas, part of the sea wall at Dawlish was breached washing away around 40 metres (130 ft) of the wall and the ballast under the railway immediately behind. The line was closed. Network Rail began repair work  and the line reopened on 4 April 2014. In the wake of widespread disruption caused by damage to the mainline track at Dawlish by coastal storms in February 2014, Network Rail are considering reopening the Tavistock to Okehampton and Exeter section of the line as an alternative to the coastal route. Devon County Council has proposed a "Devon Metro" scheme to improve rail services in the county and offer a realistic alternative to car travel. This includes the delivery of Cranbrook station, plus four new stations (including Edginswell) as a priority. Exeter Airport is a base for Flybe. Destinations include London City, Manchester, Dublin, Paris and Amsterdam. Heathland at Woodbury Common in south east Devon. Ilfracombe, on the coast of North Devon. Devon straddles a peninsula and so has two separate coastlines, on the Bristol Channel and Celtic Sea in the north, and on the English Channel in the south. The South West Coast Path runs along the entire length of both, around 65% of which is named as Heritage Coast. Before the changes to English counties in 1974, Devon was the third largest county by area and the largest of the counties not divided into county-like divisions (only Yorkshire and Lincolnshire were larger and both were sub-divided into ridings or parts, respectively). Since 1974 the county is ranked fourth by area (due to the creation of Cumbria) amongst ceremonial counties and is the third largest non-metropolitan county. The island of Lundy and the reef of Eddystone are also in Devon. The county has more mileage of road than any other county in England. Inland, the Dartmoor National Park lies wholly in Devon, and the Exmoor National Park lies in both Devon and Somerset. Apart from these areas of high moorland the county has attractive rolling rural scenery and villages with thatched cob cottages. All these features make Devon a popular holiday destination. In South Devon the landscape consists of rolling hills dotted with small towns, such as Dartmouth, Ivybridge, Kingsbridge, Salcombe, and Totnes. The towns of Torquay and Paignton are the principal seaside resorts on the south coast. East Devon has the first seaside resort to be developed in the county, Exmouth and the more upmarket Georgian town of Sidmouth, headquarters of the East Devon District Council. Exmouth marks the western end of the Jurassic Coast World Heritage Site. Another notable feature is the coastal railway line between Newton Abbot and the Exe Estuary: the red sandstone cliffs and sea views are very dramatic and in the resorts railway line and beaches are very near. North Devon is very rural with few major towns except Barnstaple, Great Torrington, Bideford and Ilfracombe. Devon's Exmoor coast has the highest cliffs in southern Britain, culminating in the Great Hangman, a 318 m (1,043 ft) "hog's-back" hill with an 250 m (820 ft) cliff-face, located near Combe Martin Bay. Its sister cliff is the 218 m (715 ft) Little Hangman, which marks the western edge of coastal Exmoor. One of the features of the North Devon coast is that Bideford Bay and the Hartland Point peninsula are both west-facing, Atlantic facing coastlines; so that a combination of an off-shore (east) wind and an Atlantic swell produce excellent surfing conditions. The beaches of Bideford Bay (Woolacombe, Saunton, Westward Ho! and Croyde), along with parts of North Cornwall and South Wales, are the main centres of surfing in Britain. Geological map of Wales & Southwest England. A geological dividing line cuts across Devon roughly along the line of the Bristol to Exeter Line and the M5 motorway east of Tiverton and Exeter. It is a part of the Tees-Exe line broadly dividing Britain into a southeastern lowland zone typified by gently dipping sedimentary rocks and a northwestern upland zone typified by igneous rocks and folded sedimentary and metamorphic rocks. The principal geological components of Devon are the Devonian (in north Devon, south west Devon and extending into Cornwall); the Culm Measures (north western Devon also extending into north Cornwall); and the granite intrusion of Dartmoor in central Devon, part of the Cornubian batholith forming the 'spine' of the southwestern peninsula. There are small remains of pre-Devonian rocks on the south Devon coast. The oldest rocks which can be dated are those of the Devonian period which are approximately 395–345 million years old. Sandstones and shales were deposited in North and South Devon beneath tropical seas. In shallower waters, limestone beds were laid down in the area now near Torquay and Plymouth. This geological period was named after Devon by Roderick Murchison and Adam Sedgwick in the 1840s and is the only British county whose name is used worldwide as a geological time period. Devon's second major rock system is the Culm Measures, a geological formation of the Carboniferous period that occurs principally in Devon and Cornwall. The measures are so called either from the occasional presence of a soft, sooty coal, which is known in Devon as culm, or from the contortions commonly found in the beds. This formation stretches from Bideford to Bude in Cornwall, and contributes to a gentler, greener, more rounded landscape. It is also found on the western, north and eastern borders of Dartmoor. The sedimentary rocks in more eastern parts of the county include Permian and Triassic sandstones (giving rise to east Devon's well known fertile red soils); Bunter pebble beds around Budleigh Salterton and Woodbury Common and Jurassic rocks in the easternmost parts of Devon. Smaller outcrops of younger rocks also exist, such as Cretaceous chalk cliffs at Beer Head and gravels on Haldon, plus Eocene and Oligocene ball clay and lignite deposits in the Bovey Basin, formed around 50 million years ago under tropical forest conditions. Devon generally has a mild climate, heavily influenced by the North Atlantic Drift. In winter snow is relatively uncommon away from high land, although there are exceptions. The county has warm summers with occasional hot spells and cool rainy periods. Winters are generally mild and the county often experiences some of the mildest winters in the world for its latitude, with average daily maximum temperatures in January approaching 10 °C (50 °F). Rainfall varies significantly across the county, ranging from over 2,000 mm (79 in) on parts of Dartmoor, to around 750 mm (30 in) in the rain shadow along the coast in southeastern Devon and around Exeter. Sunshine amounts also vary widely: the moors are generally cloudy, but the SE coast from Salcombe to Exmouth is one of the sunniest parts of the UK. With westerly or southwesterly winds and high pressure the area around Torbay and Teignmouth will often be very warm, with long sunny spells due to shelter by high ground (Foehn wind). Fields in south Devon after a snowfall. Ponies grazing on Exmoor near Brendon, North Devon. The variety of habitats means that there is a wide range of wildlife (see Dartmoor wildlife, for example). A popular challenge among birders is to find over 100 species in the county in a day. The county's wildlife is protected by several wildlife charities such as the Devon Wildlife Trust, which looks after 40 nature reserves. The Devon Bird Watching and Preservation Society (founded in 1928 and known since 2005 as "Devon Birds") is a county bird society dedicated to the study and conservation of wild birds. The RSPB has reserves in the county, and Natural England is responsible for over 200 Devon Sites of Special Scientific Interest and National Nature Reserves, such as Slapton Ley. The Devon Bat Group was founded in 1984 to help conserve bats. Wildlife found in this area extend to a plethora of different kinds of insects, butterflies and moths; an interesting butterfly to take look at is the Chequered skipper. The botany of the county is very diverse and includes some rare species not found elsewhere in the British Isles other than Cornwall. Devon is divided into two Watsonian vice-counties: north and south, the boundary being an irregular line approximately across the higher part of Dartmoor and then along the canal eastwards. Botanical reports begin in the 17th century and there is a Flora Devoniensis by Jones and Kingston in 1829. A general account appeared in The Victoria History of the County of Devon (1906), and a Flora of Devon was published in 1939 by Keble Martin and Fraser. An Atlas of the Devon Flora by Ivimey-Cook appeared in 1984, and A New Flora of Devon, based on field work undertaken between 2005 and 2014, was published in 2016. Rising temperatures have led to Devon becoming the first place in modern Britain to cultivate olives commercially. County Hall, Exeter. Headquarters for Devon County Council. The administrative centre and capital of Devon is the city of Exeter. The largest city in Devon, Plymouth, and the conurbation of Torbay (which includes the largest town in Devon and capital of Torbay, Torquay, as well as Paignton and Brixham) have been unitary authorities since 1998, separate from the remainder of Devon which is administered by Devon County Council for the purposes of local government. Devon County Council is controlled by the Conservatives, and the political representation of its 62 councillors are: 38 Conservatives, 9 Liberal Democrats, seven Labour, four UKIP, three Independents and one Green. At the 2015 general election, Devon returned 11 Conservatives and one Labour MP from its 12 constituencies through first-past-the-post. The county is represented in the wider South West England (European Parliament constituency), which returned two UKIP, two Conservative, one Labour and one Green MEP at the 2014 election using the d'Hondt method of party-list proportional representation. Historically Devon was divided into 32 hundreds: Axminster, Bampton, Black Torrington, Braunton, Cliston, Coleridge, Colyton, Crediton, East Budleigh, Ermington, Exminster, Fremington, Halberton, Hartland, Hayridge, Haytor, Hemyock, Lifton, North Tawton and Winkleigh, Ottery, Plympton, Roborough, Shebbear, Shirwell, South Molton, Stanborough, Tavistock, Teignbridge, Tiverton, West Budleigh, Witheridge, and Wonford. The inner harbour, Brixham, south Devon, at low tide. The main settlements in Devon are the cities of Plymouth, a historic port now administratively independent, Exeter, the county town, and Torbay, the county's tourist centre. Devon's coast is lined with tourist resorts, many of which grew rapidly with the arrival of the railways in the 19th century. Examples include Dawlish, Exmouth and Sidmouth on the south coast, and Ilfracombe and Lynmouth on the north. The Torbay conurbation of Torquay, Paignton and Brixham on the south coast is now administratively independent of the county. Rural market towns in the county include Barnstaple, Bideford, Honiton, Newton Abbot, Okehampton, Tavistock, Totnes and Tiverton. The region of Devon was the dominion of the Dumnonii Celtic tribe they were also called "Deep Valley Dwellers". The region was less Romanised than the rest of Roman Britain since it was considered a remote province. The Romans left the region around AD 410, this is when one of the leading Dumnonii families attempted to create a dynasty and rules over Devon as the Kings of Dumnonii. Celtic paganism and Roman practices were the first known religions in Devon, although in the mid-fourth century AD, Christianity was introduced to Devon. In the Sub-Roman period the church in the British Isles was characterised by some differences in practice from the Latin Christianity of the continent of Europe and is known as Celtic Christianity; however it was always in communion with the wider Roman Catholic Church. Many Cornish saints are commemorated also in Devon in legends, churches and placenames. Western Christianity came to Devon when it was over a long period incorporated into the kingdom of Wessex and the jurisdiction of the bishop of Wessex. Saint Petroc is said to have passed through Devon, where ancient dedications to him are even more numerous than in Cornwall: a probable seventeen (plus Timberscombe just over the border in Somerset), compared to Cornwall's five. The position of churches bearing his name, including one within the old Roman walls of Exeter, are nearly always near the coast, reminding us that in those days travelling was done mainly by sea. The Devonian villages of Petrockstowe and Newton St Petroc are also named after Saint Petroc and the flag of Devon is dedicated to him. The history of Christianity in the South West of England remains to some degree obscure. Parts of the historic county of Devon formed part of the diocese of Wessex, while nothing is known of the church organisation of the Celtic areas. About 703 Devon and Cornwall were included in the separate diocese of Sherborne and in 900 this was again divided into two, the Devon bishop having from 905 his seat at Tawton (now Bishop's Tawton) and from 912 at Crediton, birthplace of St Boniface. Lyfing became Bishop of Crediton in 1027 and shortly afterwards became Bishop of Cornwall. The two dioceses of Crediton and Cornwall, covering Devon and Cornwall, were permanently united under Edward the Confessor by Lyfing's successor Bishop Leofric, hitherto Bishop of Crediton, who became first Bishop of Exeter under Edward the Confessor, which was established as his cathedral city in 1050. At first, the abbey church of St Mary and St Peter, founded by Athelstan in 932 and rebuilt in 1019, served as the cathedral. In 1549, the Prayer Book Rebellion caused the deaths of thousands of people from Devon and Cornwall. During the English Reformation, churches in Devon officially became affiliated with the Church of England. From the late sixteenth century onwards, zealous Protestantism – or 'puritanism' – became increasingly well-entrenched in some parts of Devon, while other districts of the county remained much more conservative. These divisions would become starkly apparent during the English Civil War of 1642–46, when the county split apart along religious and cultural lines. The Methodism of John Wesley proved to be very popular with the working classes in Devon in the 19th century. Methodist chapels became important social centres, with male voice choirs and other church-affiliated groups playing a central role in the social lives of working class Devonians. Methodism still plays a large part in the religious life of Devon today, although the county has shared in the post-World War II decline in British religious feeling. The Diocese of Exeter remains the Anglican diocese including the whole of Devon. The Roman Catholic Diocese of Plymouth was established in the mid 19th century. Despite its small Jewish population, Devon is also noted for containing two of Britain's oldest synagogues, located in Plymouth and Exeter, built in 1762 and 1763 respectively. The coat of arms of Devon County Council. There was no established coat of arms for the county until 1926: the arms of the City of Exeter were often used to represent Devon, for instance in the badge of the Devonshire Regiment. During the forming of a county council by the Local Government Act 1888 adoption of a common seal was required. The seal contained three shields depicting the arms of Exeter along with those of the first chairman and vice-chairman of the council (Lord Clinton and the Earl of Morley). On 11 October 1926, the county council received a grant of arms from the College of Arms. The main part of the shield displays a red crowned lion on a silver field, the arms of Richard Plantagenet, Earl of Cornwall. The chief or upper portion of the shield depicts an ancient ship on wavers, for Devon's seafaring traditions. The Latin motto adopted was Auxilio Divino (by Divine aid), that of Sir Francis Drake. The 1926 grant was of arms alone. On 6 March 1962 a further grant of crest and supporters was obtained. The crest is the head of a Dartmoor Pony rising from a "Naval Crown". This distinctive form of crown is formed from the sails and sterns of ships, and is associated with the Royal Navy. The supporters are a Devon bull and a sea lion. Devon County Council adopted a "ship silhouette" logo after the 1974 reorganisation, adapted from the ship emblem on the coat of arms, but following the loss in 1998 of Plymouth and Torbay re-adopted the coat of arms. In April 2006 the council unveiled a new logo which was to be used in most everyday applications, though the coat of arms will continue to be used for "various civic purposes". Devon also has its own flag which has been dedicated to Saint Petroc, a local saint with dedications throughout Devon and neighbouring counties. The flag was adopted in 2003 after a competition run by BBC Radio Devon. The winning design was created by website contributor Ryan Sealey, and won 49% of the votes cast. The colours of the flag are those popularly identified with Devon, for example, the colours of Exeter University, the rugby union team, and the Green and White flag flown by the first Viscount Exmouth at the Bombardment of Algiers (now on view at the Teign Valley Museum), as well as one of the county's football teams, Plymouth Argyle. On 17 October 2006, the flag was hoisted for the first time outside County Hall in Exeter to mark Local Democracy Week, receiving official recognition from the county council. The beach at Westward Ho!, North Devon, looking north towards the shared estuary of the rivers Taw and Torridge. Devon's toponyms include many with the endings "coombe/combe" and "tor". Both 'coombe' (valley or hollow, cf. Welsh cwm, Cornish komm) and 'tor' (Old Welsh twrr and Scots Gaelic tòrr from Latin turris; 'tower' used for granite formations) are rare Celtic loanwords in English and their frequency is greatest in Devon which shares a boundary with Brittonic speaking Cornwall. Ruined medieval settlements of Dartmoor longhouses indicate that dispersed rural settlement (OE tun, now often -ton) was very similar to that found in Cornish 'tre-' settlements, however these are generally described with the local placename -(a)cott, from the Old English for homestead, cf. cottage. Saxon endings in -worthy (from Anglo-Saxon worthig) indicate larger settlements. Several 'Bere's indicate Anglo-Saxon wood groves, as 'leighs' indicate clearings. Devon has a variety of festivals and traditional practices, including the traditional orchard-visiting Wassail in Whimple every 17 January, and the carrying of flaming tar barrels in Ottery St. Mary, where people who have lived in Ottery for long enough are called upon to celebrate Bonfire Night by running through the village (and the gathered crowds) with flaming barrels on their backs. Berry Pomeroy still celebrates "Queen's Day" for Elizabeth I.
Devon has a mostly comprehensive education system. There are 37 state and 23 independent secondary schools. There are three tertiary (FE) colleges and an agricultural college (Bicton College, near Budleigh Salterton). Torbay has 8 state (with 3 grammar schools) and 3 independent secondary schools, and Plymouth has 17 state (with 3 grammar schools – two female and one male) and one independent school, Plymouth College. East Devon and Teignbridge have the largest school populations, with West Devon the smallest (with only two schools). Only one school in Exeter, Mid Devon, Torridge and North Devon have a sixth form – the schools in other districts mostly have sixth forms, with all schools in West Devon and East Devon having a sixth form. Two universities are located in Devon, the University of Exeter (split between the Streatham Campus and St Luke's Campus, both in Exeter, and a campus in Cornwall); in Plymouth the University of Plymouth in Britain is present, along with the University of St Mark & St John to the city's north. The universities of Exeter and Plymouth have together formed the Peninsula College of Medicine and Dentistry which has bases in Exeter and Plymouth. There is also Schumacher College. The county has given its name to a number of culinary specialities. The Devonshire cream tea, involving scones, jam and clotted cream, is thought to have originated in Devon (though claims have also been made for neighbouring counties); in other countries, such as Australia and New Zealand, it is known as a "Devonshire tea". In Australia, Devon is a name for luncheon meat (processed ham). In October 2008, Devon was awarded Fairtrade County status by the Fairtrade Foundation. Devon has been home to a number of customs, such as its own form of Devon wrestling, similar in some ways to Cornish wrestling. As recently as the 19th century, a crowd of 17,000 at Devonport, near Plymouth, attended a match between the champions of Devon and Cornwall. Another Devon sport was outhurling which was played in some regions until the 20th century (e.g. 1922, at Great Torrington). Other ancient customs which survive include Dartmoor step dancing, and "Crying The Neck". Devon has three professional football teams, based in each of its most populous towns and cities. As of the 2017–2018 football season, Plymouth Argyle F.C. compete in English Football League One (the third tier of English professional football), Exeter City F.C. compete in English Football League Two (the fourth tier), while Torquay United F.C. compete in the National League (the fifth tier). Plymouth's highest Football League finish was fourth in the Second Division, which was achieved twice, in 1932 and 1953. Torquay and Exeter have never progressed beyond the third tier of the league; Torquay finished second on goal average in the Third Division (S) behind Sir Alf Ramsey's Ipswich Town in 1957. Exeter's highest position has been eighth in the Third Division (S). The county's biggest non-league clubs are Bideford F.C. which competes in the Southern Football League Premier Division, and Tiverton Town F.C. which is in the Southern Football League Division One South and West. Rugby Union is popular in Devon with over forty clubs under the banner of the Devon Rugby Football Union, many with various teams at senior, youth and junior levels. One club – Exeter Chiefs play in the Aviva Premiership, winning the title in 2017 for the first time in their history after beating Wasps RFC in the final 23–20. Plymouth Albion who are, as of 2017, in the National League 1 (The 3rd tier of English Professional Rugby Union. There are five rugby league teams in Devon. Plymouth Titans, Exeter Centurions, Devon Sharks from Torquay, North Devon Raiders from Barnstaple and East Devon Eagles from Exmouth. They all play in the Rugby League Conference. In basketball, Plymouth Raiders play in the British Basketball League. Tamar Valley Cannons, also based in Plymouth, are Devon's only other representatives in the National Leagues. Motorcycle speedway is also supported in the county, with both the Exeter Falcons and Plymouth Devils succeeding in the National Leagues in recent years. The University of Exeter Hockey Club enter teams in both the Men's and Women's England Hockey Leagues. Horse Racing is also popular in the county, with two National Hunt racecourses (Exeter and Newton Abbot), and numerous point to point courses. There are also many successful professional racehorse trainers based in Devon. The county is represented in cricket by Devon County Cricket Club, who play at a Minor counties level. Devon is known for its mariners, such as Sir Francis Drake, Sir Humphrey Gilbert, Sir Richard Grenville, Sir Walter Raleigh, and Sir Francis Chichester. Henry Every, described as the most notorious pirate of the late 17th century, was probably born in the village of Newton Ferrers. John Oxenham (1536–1580) was a lieutenant of Drake but considered a pirate by the Spanish. Thomas Morton (1576–1647) was an avid Elizabethan outdoorsman probably born in Devon who became an attorney for The Council For New England, and built the New England fur-trading-plantation called Ma-Re Mount or Merrymount around a West Country-style Maypole, much to the displeasure of Pilgrim and Puritan colonists. Morton wrote a 1637 book New English Canaan about his experiences, partly in verse, and may have thereby become America's first poet to write in English. Another famous mariner and Devonian was Robert Falcon Scott, the leader of the unfortunate Terra Nova Expedition to reach the geographical South Pole. The poet Samuel Taylor Coleridge, the crime writer Agatha Christie, the Irish writer William Trevor, and the poet Ted Hughes lived in Devon. The painter and founder of the Royal Academy, Sir Joshua Reynolds, was born in Devon. Chris Dawson, the billionaire owner of retailer The Range was born in Devon, where his business retains its head office in Plymouth. The actor Matthew Goode was raised in Devon, and Bradley James, also an actor, was born there. The singer Joss Stone was brought up in Devon and frontman Chris Martin from the British rock group Coldplay was born there. Matt Bellamy, Dominic Howard and Chris Wolstenholme from the English group Muse all grew up in Devon and formed the band there. Dave Hill of rock band Slade was born in Flete House which is in the South Hams district of Devon. Singer-songwriter Ben Howard grew up in Totnes, a small town in Devon. Another famous Devonian is the model and actress Rosie Huntington-Whiteley, who was born in Plymouth and raised in Tavistock. The singer and songwriter Rebecca Newman was born and raised in Exmouth. Roger Deakins, called “the pre-eminent cinematographer of our time", was born and lives in Devon. Trevor Francis, former Nottingham Forest and Birmingham City professional footballer, and the first English footballer to cost £1 million, was born and brought up in Plymouth. Swimmer Sharron Davies and diver Tom Daley were born in Plymouth. The Olympic runner Jo Pavey was born in Honiton. Peter Cook the satirist, writer and comedian was born in Torquay, Devon. Leicester Tigers and British and Irish Lions Rugby player Julian White MBE was born and raised in Devon and now farms a herd of pedigree South Devon beef cattle. The dog breeder John "Jack" Russell was also from Devon. Jane McGrath, who married Australian cricketer Glenn McGrath was born in Paignton, her long battle with and subsequent death from breast cancer inspired the formation of the McGrath Foundation, which is one of Australia's leading charities. ^ Data is collected by local authority areas (Devon, Plymouth, Torbay respectively). Total population of Devon is 1,133,742 (746,399 + 256,384 + 130,959). Total population of White British persons is 1,071,015 (708,590 + 238,263 + 124,162). Percentage of White British persons is 94.467%. ^ "Lord-Lieutenant for Devon: David Fursdon - Press releases". GOV.UK. 26 March 2015. Archived from the original on 8 March 2016. Retrieved 13 November 2016. ^ "Brentor's Simon named as High Sheriff of Devon". Okehampton Times. Retrieved 16 April 2019. ^ "2011 Census: Ethnic group, local authorities in England and Wales". Office for National Statistics. Archived from the original on 11 May 2017. Retrieved 27 July 2018. ^ "Devon | county, England, United Kingdom". Encyclopedia Britannica. Archived from the original on 23 August 2017. Retrieved 4 July 2017. ^ "Devon County Council Geographic areas". Devon County Council. Archived from the original on 22 August 2012. Retrieved 12 December 2012. ^ "Welcome to the Dartmoor National Park Authority". Naturalengland.org.uk. Archived from the original on 6 September 2011. Retrieved 13 November 2016. ^ "William Camden, Britannia (1607) with an English translation by Philemon Holland – Danmonii". The University of Birmingham. Archived from the original on 16 March 2009. Retrieved 30 June 2009. ^ "Manuscript A: The Parker Chronicle". Archived from the original on 26 July 2011. Retrieved 17 October 2016. ^ Davies, Norman (2000). The Isles: A History. p. 207. ISBN 0-333-69283-7. ^ "Who do you think you really are? A genetic map of the British Isles - University of Oxford". Archived from the original on 17 February 2017. Retrieved 13 November 2016. ^ "Who do you think you really are? The first fine-scale genetic map of the British Isles". wellcome.ac.uk. Archived from the original on 21 March 2015. Retrieved 19 March 2015. ^ jobs. "UK mapped out by genetic ancestry : Nature News & Comment". Nature.com. Archived from the original on 10 November 2016. Retrieved 13 November 2016. ^ "Lydford Silver Pennies In The Stockholm Coin Museum". Lydford.co.uk. Archived from the original on 5 March 2016. Retrieved 13 November 2016. ^ "Devon's Mining History and Stannary parliament". users.senet.com.au. Archived from the original on 11 May 2008. Retrieved 29 March 2008. ^ "Devon dairy farmer laments 'grim' state of industry as milk price crisis worsens". The Mid Devon Gazette. 14 January 2015. Retrieved 18 July 2016. ^ "Devon Delivers". Invest Devon. Archived from the original on 23 December 2016. Retrieved 13 November 2016. ^ Key Statistics: Population; Quick Statistics: Economic indicators Archived 11 February 2003 at the Wayback Machine. (2011 census and 2001 census) Retrieved 27 February 2015. ^ Harris, Nigel (2008). "Taking trains back to Tavistock". Rail. Bauer (590): 40–45. ^ "UK storms destroy railway line and leave thousands without power". BBC. Archived from the original on 5 February 2014. Retrieved 5 February 2014. ^ "Dawlish's storm-damaged railway line reopens". BBC News. 4 April 2014. Archived from the original on 4 April 2014. Retrieved 4 April 2014. ^ "Network Rail chooses Dawlish alternative route". BBC News. 10 February 2014. Archived from the original on 11 February 2014. Retrieved 10 February 2014. ^ Dewey, Henry (1948) British Regional Geology: South West England, 2nd ed. London: H.M.S.O. ^ Hesketh, Robert (2006). Devon's Geology: An Introduction. Bossiney Books. ISBN 978-1-899-383-89-4. ^ Laming, Deryck; Roche, David. "Devon Geology Guide – Devonian Slates, Sandstones and Volcanics" (PDF). Archived from the original (PDF) on 10 November 2013. Retrieved 14 May 2014. ^ "Devon's Rocks – A Geological Guide". Devon County Council. Archived from the original on 3 March 2016. Retrieved 18 May 2011. ^ Edmonds, E. A.; McKeown, M. C.; Williams, M. (1975). "Carboniferous Rocks". South-West England. British Geology. Dewey, H. (4th ed.). London: HMSO/British Geological Survey. p. 34. ISBN 0-11-880713-7. ^ "The Society – Introduction". Devon Birds. Archived from the original on 21 December 2016. Retrieved 15 December 2016. ^ "Designated sites view (Devon)". Natural England. Archived from the original on 20 December 2016. Retrieved 15 December 2016. ^ Smith, R.; Hodgson, B.; Ison, J. (2016). A New Flora of Devon. Exeter: The Devonshire Association. p. 1. ISBN 978 1 5272 0525 3. ^ Paul Simons (14 May 2007). "Britain warms to the taste for home-grown olives". The Times. UK. Archived from the original on 6 July 2008. Retrieved 20 September 2007. ^ "Tories take over county council". The BBC. 5 June 2009. Archived from the original on 8 June 2009. Retrieved 6 June 2009. ^ "Devon Hundreds". Genuki.cs.ncl.ac.uk. 23 June 2013. Archived from the original on 27 April 2016. Retrieved 13 November 2016. ^ "Britannia History: Overview of Devon". www.britannia.com. Archived from the original on 3 February 2018. Retrieved 4 July 2017. ^ "Devon Libraries: Sources for Anglo-Saxon Devon" (PDF). Archived (PDF) from the original on 2 February 2017. ^ "St. Patrick and Celtic Christianity: Did You Know?". Christian History | Learn the History of Christianity & the Church. Archived from the original on 12 June 2017. Retrieved 4 July 2017. ^ "Monasticism - The Heart of Celtic Christianity - Northumbria Community". Northumbria Community. Archived from the original on 17 January 2017. Retrieved 4 July 2017. ^ Stoyle, Mark (1994). Loyalty and Locality: Popular Allegiance in Devon during the English Civil War. Exeter: University of Exeter Press. p. passim. ISBN 0-85989-428-2. ^ "Home". Plymouth-diocese.org.uk. 15 February 2015. Archived from the original on 21 October 2016. Retrieved 13 November 2016. ^ "A brief history of Devon's coat of arms (Devon County Council)". Devon.gov.uk. Archived from the original on 11 May 2011. Retrieved 14 June 2010. ^ "Council's designs cause logo row". BBC News. 27 March 2006. Archived from the original on 12 May 2011. Retrieved 14 June 2010. ^ "Policy and Resources Overview Scrutiny Committee Minutes, 3 April 2006". Devon.gov.uk. Archived from the original on 11 May 2011. Retrieved 14 June 2010. ^ "Flag celebrates Devon's heritage". BBC. 18 July 2003. Archived from the original on 25 April 2010. Retrieved 14 June 2010. ^ "Origins of Devon Place-Names". Genuki.cs.ncl.ac.uk. 2 November 2014. Archived from the original on 14 November 2016. Retrieved 13 November 2016. ^ "Ottery Tar Barrels". BBC. Archived from the original on 19 May 2008. Retrieved 14 May 2008. ^ Marley, David F. (2010). Pirates of the Americas. Santa Barbara, CA: ABC-CLIO. p. 589. ISBN 978-1-59884-201-2. ^ "'Rising star' returns to Exmouth to support RNLI". 23 October 2012. Retrieved 13 November 2016. ^ "Cinematographer Roger Deakins Takes Visceral Approach To His Craft". Variety. 4 October 2017. Archived from the original on 11 December 2017. Retrieved 20 December 2017. ^ "The day Trevor Francis broke football's £1m mark". The Telegraph. 9 February 2009. Archived from the original on 6 March 2015. Retrieved 29 September 2014. ^ "New centre to honour Plymouth Olympian Sharron Davies". Plymouth City Council. 14 March 2007. Archived from the original on 30 March 2007. Retrieved 31 August 2008. Bideford ( BID-ə-fərd) is a historic port town on the estuary of the River Torridge in north Devon, south-west England. It is the main town of the Torridge local government district. Devon Hughes (born August 1, 1972) is an American semi-retired professional wrestler. He is currently signed to WWE, where he works backstage as a producer. Hughes wrestled for Extreme Championship Wrestling (ECW) from 1995 to 1999 and for the WWF/E from 1999 to 2005 and from 2015 to 2016 as D-Von Dudley and Reverend D-Von. He performed with Total Nonstop Action Wrestling (TNA) from 2005 to 2014 as Brother Devon and Devon. Characterized by their unorthodox ring attire and usage of tables in their matches, The Dudley Boyz are one of the most successful tag teams in the history of professional wrestling, recognized by TNA as 23-time world tag team champions, and were the first tag team inducted into the TNA Hall of Fame. Including his two TNA Television Championship reigns, Hughes has held 25 major championships between ECW, WWE, TNA and New Japan Pro Wrestling (NJPW). Both Dudleys were inducted into the WWE Hall of Fame in 2018. Dartmouth is a town and civil parish in the English county of Devon. It is a tourist destination set on the western bank of the estuary of the River Dart, which is a long narrow tidal ria that runs inland as far as Totnes. It lies within the South Devon Area of Outstanding Natural Beauty and South Hams district, and had a population of 5,512 in 2001, reducing to 5,064 at the 2011 census There are two electoral wards in the Dartmouth area (Townstal & Kingswear). Their combined population at the above census was 6,822. Devon Island (Inuit: Tatlurutit) is an island in Canada and the largest uninhabited island on Earth. It is located in Baffin Bay, Qikiqtaaluk Region, Nunavut, Canada. It is one of the larger members of the Canadian Arctic Archipelago, the second-largest of the Queen Elizabeth Islands, Canada's sixth-largest island, and the 27th-largest island in the world. It comprises 55,247 km2 (21,331 sq mi) (slightly smaller than Croatia) of Precambrian gneiss and Paleozoic siltstones and shales. The highest point is the Devon Ice Cap at 1,920 m (6,300 ft) which is part of the Arctic Cordillera. Devon Island contains several small mountain ranges, such as the Treuter Mountains, Haddington Range and the Cunningham Mountains. The notable similarity of its surface to that of Mars has attracted interest from scientists. The Devon Rugby Football Union is the governing body for the sport of rugby union in the county of Devon in England. The union is the constituent body of the Rugby Football Union (RFU) for Devon, and administers and organises rugby union clubs and competitions in the county. It also administers the Devon county rugby representative teams. Devon and Cornwall Police is the territorial police force responsible for policing the counties of Devon and Cornwall, including the unitary authority areas of Plymouth, Torbay and the Isles of Scilly. The geographical area covered is the largest for any police force in England, and the fifth largest in the United Kingdom. The total resident population of the force area is approximately 1.5 million, with around 11 million visitors annually. The force was formed on 1 April 1967 by the amalgamation of the Devon and Exeter Police, Cornwall County Constabulary and Plymouth City Police, these three constabularies were an amalgamation of 23 city and borough police forces that were absorbed between 1856 and 1947. The Devonian is a geologic period and system of the Paleozoic, spanning 60 million years from the end of the Silurian, 419.2 million years ago (Mya), to the beginning of the Carboniferous, 358.9 Mya. It is named after Devon, England, where rocks from this period were first studied. The first significant adaptive radiation of life on dry land occurred during the Devonian. Free-sporing vascular plants began to spread across dry land, forming extensive forests which covered the continents. By the middle of the Devonian, several groups of plants had evolved leaves and true roots, and by the end of the period the first seed-bearing plants appeared. Various terrestrial arthropods also became well-established. Fish reached substantial diversity during this time, leading the Devonian to often be dubbed the "Age of Fishes." The first ray-finned and lobe-finned bony fish appeared, while the placoderms began dominating almost every known aquatic environment. The ancestors of all four-limbed vertebrates (tetrapods) began adapting to walking on land, as their strong pectoral and pelvic fins gradually evolved into legs. In the oceans, primitive sharks became more numerous than in the Silurian and Late Ordovician. The first ammonites, species of molluscs, appeared. Trilobites, the mollusc-like brachiopods and the great coral reefs, were still common. The Late Devonian extinction which started about 375 million years ago severely affected marine life, killing off all placodermi, and all trilobites, save for a few species of the order Proetida. The palaeogeography was dominated by the supercontinent of Gondwana to the south, the continent of Siberia to the north, and the early formation of the small continent of Euramerica in between. The English football league system, also known as the football pyramid, is a series of interconnected leagues for men's association football clubs in England, with five teams from Wales and one from Guernsey also competing. The system has a hierarchical format with promotion and relegation between leagues at different levels, allowing even the smallest club the theoretical possibility of ultimately rising to the very top of the system, although in practice it would take a team at the bottom levels at least two decades of consistently finishing at or near the top of each successive league to reach the top level, and even then additional restrictions, particularly in regard to stadium facilities, would then come into effect at the highest levels that could prevent a club from being allowed access to the top levels. There are more than 140 individual leagues, containing more than 480 divisions.The exact number of clubs varies from year to year as clubs join and leave leagues, fold or merge altogether, but an estimated average of 15 clubs per division implies that more than 7,000 teams of nearly 5,300 clubs are members of a league in the English men's football league system. As there are no official definitions of any level below 11, any references to the structure at level 12 and below should not be regarded as definitive. The pyramid for women's football in England runs separately to nine tiers and some England-based men's clubs play outside the English football league system. Exeter ( (listen)) is a cathedral city in Devon, England, with a population of 129,800 (mid-2016 EST). The city is located on the River Exe approximately 36 miles (58 km) northeast of Plymouth and 65 miles (105 km) southwest of Bristol. It is the county town of Devon, and the base of Devon County Council. Also situated in Exeter are two campuses of the University of Exeter - Streatham Campus and St Luke's Campus. In Roman Britain, Exeter was established as the base of Legio II Augusta under the personal command of Vespasian. Exeter became a religious centre during the Middle Ages and into the Tudor times: Exeter Cathedral, founded in the mid 11th century, became Anglican during the 16th-century English Reformation. During the late 19th century, Exeter became an affluent centre for the wool trade, although by the First World War the city was in decline. After the Second World War, much of the city centre was rebuilt and is now considered to be a centre for modern business and tourism in Devon and Cornwall. The administrative area of Exeter has the status of a non-metropolitan district under the administration of the County Council; a plan to grant the city unitary authority status was scrapped under the 2010 coalition government. Exmouth is a port town, civil parish and seaside resort, sited on the east bank of the mouth of the River Exe and 11 miles (18 km) southeast of Exeter. In 2011 it had a population of 34,432, making Exmouth the 5th most populous settlement in Devon. The Jurassic Coast is a World Heritage Site on the English Channel coast of southern England. It stretches from Exmouth in East Devon to Studland Bay in Dorset, a distance of about 96 miles (154 km), and was inscribed on the World Heritage List in mid-December 2001.The site spans 185 million years of geological history, coastal erosion having exposed an almost continuous sequence of rock formation covering the Triassic, Jurassic and Cretaceous periods. At different times, this area has been desert, shallow tropical sea and marsh, and the fossilised remains of the various creatures that lived here have been preserved in the rocks. Natural features seen on this stretch of coast include arches, pinnacles and stack rocks. In some places the sea has broken through resistant rocks to produce coves with restricted entrances, and in one place, the Isle of Portland is connected to the land by a narrow spit. In some parts of the coast, landslides are common. These have exposed a wide range of fossils, the different rock types each having its own typical fauna and flora, thus providing evidence of how animals and plants evolved in this region. The area around Lulworth Cove contains a fossil forest, and 71 different rock strata have been identified at Lyme Regis, each with its own species of ammonite. The fossil collector Mary Anning lived here and her major discoveries of marine reptiles and other fossils were made at a time when the study of palaeontology was just starting to develop. The Charmouth Heritage Coast Centre provides information on the heritage coast, and the whole length of the site can be visited via the South West Coast Path. Knight Rider is an American television series created and produced by Glen A. Larson. The series was originally broadcast on NBC from 1982 to 1986. The show stars David Hasselhoff as Michael Knight, a high-tech modern crime fighter assisted by KITT, an advanced artificially intelligent, self-aware and nearly indestructible car. This was the last series Larson devised at Universal Television before he moved to 20th Century Fox. The Minor Counties Cricket Championship is a season-long competition in England that is contested by those county cricket clubs that do not have first-class status. North Devon is a local government district in Devon, England. Its council is based in Barnstaple. Other towns and villages in the North Devon District include Braunton, Fremington, Ilfracombe, Instow, South Molton, Lynton and Lynmouth. The district was formed on 1 April 1974 as a merger of the Barnstaple municipal borough, the Ilfracombe and Lynton urban districts, and the Barnstaple and South Molton rural districts. The wider geographic area of North Devon is divided between North Devon District and the district of Torridge, based in Bideford. Plymouth ( (listen)) is a port city situated on the south coast of Devon, England, approximately 37 miles (60 km) south-west of Exeter and 190 miles (310 km) west-south-west of London. Enclosing the city are the mouths of the river Plym and river Tamar, which are naturally incorporated into Plymouth Sound to form a boundary with Cornwall. Plymouth's early history extends to the Bronze Age, when a first settlement emerged at Mount Batten. This settlement continued as a trading post for the Roman Empire, until it was surpassed by the more prosperous village of Sutton founded in the ninth century, now called Plymouth. In 1620, the Pilgrim Fathers departed Plymouth for the New World and established Plymouth Colony, the second English settlement in what is now the United States of America. During the English Civil War, the town was held by the Parliamentarians and was besieged between 1642 and 1646. Throughout the Industrial Revolution, Plymouth grew as a commercial shipping port, handling imports and passengers from the Americas, and exporting local minerals (tin, copper, lime, china clay and arsenic). The neighbouring town of Devonport became a strategic Royal Naval shipbuilding and dockyard town. In 1914 three neighbouring independent towns, viz., the county borough of Plymouth, the county borough of Devonport, and the urban district of East Stonehouse were merged to form a single County Borough. The combined town took the name of Plymouth which, in 1928, achieved city status. The city's naval importance later led to its being targeted by the German military and partially destroyed by bombing during World War II, an act known as the Plymouth Blitz. After the war the city centre was completely rebuilt and subsequent expansion led to the incorporation of Plympton and Plymstock along with other outlying suburbs in 1967. The city is home to 263,100 (mid-2017 est.) people, making it the 30th-most populous built-up area in the United Kingdom and the second-largest city in the South West, after Bristol. It is governed locally by Plymouth City Council and is represented nationally by three MPs. Plymouth's economy remains strongly influenced by shipbuilding and seafaring including ferry links to Brittany (Roscoff and St Malo) and Spain (Santander), but has tended toward a service-based economy since the 1990s. It has the largest operational naval base in Western Europe, HMNB Devonport, and is home to the University of Plymouth. The Tamar (; Cornish: Dowr Tamar) is a river in south west England, that forms most of the border between Devon (to the east) and Cornwall (to the west). The area is a World Heritage Site due to its historic mining activities. The Tamar's source is less than 6 km (3.7 mi) from the north Cornish coast, but it flows southward and its course runs across the peninsula to the south coast. The total length of the river is 61 miles (98 km). At its mouth, the Tamar flows into the Hamoaze before entering Plymouth Sound, a bay of the English Channel. Tributaries of the river include the rivers Inny, Ottery, Kensey and Lynher (or St Germans River) on the Cornish side, and the Deer and Tavy on the Devon side. The name Tamar (or Tamare) was mentioned by Ptolemy in the second century in his Geography. The name is said to mean "Great Water." The Tamar is one of several British rivers whose ancient name is assumed by some to be derived from a prehistoric river word apparently meaning "dark flowing" and which it shares with the River Thames.The seventh century Ravenna Cosmography mentions a Roman settlement named Tamaris, but it is unclear which of the towns along the Tamar this refers to. Plymouth, Launceston and the Roman fort at Calstock have been variously suggested. Tiverton ( TIV-ər-tən) is a town and civil parish in the English county of Devon and the main commercial and administrative centre of the Mid Devon district. It has also become a dormitory town for commuters to Exeter and Taunton. The built-up area had a population of 19,544 in 2011 and the parish had 21,335. Sir Walter Raleigh (; c. 1552 (or 1554) – 29 October 1618), also spelled Ralegh, was an English landed gentleman, writer, poet, soldier, politician, courtier, spy and explorer. He was cousin to Sir Richard Grenville and younger half-brother of Sir Humphrey Gilbert. He is also well known for popularising tobacco in England. Raleigh was one of the most notable figures of the Elizabethan era. Raleigh was born to a Protestant family in Devon, the son of Walter Raleigh and Catherine Champernowne. Little is known of his early life, though in his late teens he spent some time in France taking part in the religious civil wars. In his 20s he took part in the suppression of rebellion in Ireland participating in the Siege of Smerwick. Later, he became a landlord of property confiscated from the native Irish. He rose rapidly in the favour of Queen Elizabeth I and was knighted in 1585. Raleigh was instrumental in the English colonisation of North America and was granted a royal patent to explore Virginia, paving the way for future English settlements. In 1591, he secretly married Elizabeth Throckmorton, one of the Queen's ladies-in-waiting, without the Queen's permission, for which he and his wife were sent to the Tower of London. After his release, they retired to his estate at Sherborne, Dorset. In 1594, Raleigh heard of a "City of Gold" in South America and sailed to find it, publishing an exaggerated account of his experiences in a book that contributed to the legend of "El Dorado". After Queen Elizabeth died in 1603, Raleigh was again imprisoned in the Tower, this time for being involved in the Main Plot against King James I, who was not favourably disposed towards him. In 1616, he was released to lead a second expedition in search of El Dorado. During the expedition, men led by his top commander ransacked a Spanish outpost, in violation of both the terms of his pardon and the 1604 peace treaty with Spain. Raleigh returned to England and, to appease the Spanish, he was arrested and executed in 1618. The West Country is a loosely defined area of south-western England. The term usually encompasses the historic counties of Cornwall, Devon, Dorset, Somerset, and often the counties of Bristol, Gloucestershire and Wiltshire, in the South West region. The region is host to distinctive regional dialects and accents. Some definitions also include Herefordshire.